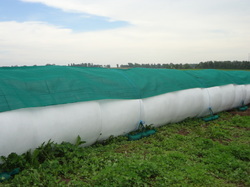 Bale Amour® provides Secure Covers-type protection against hail, birds, deer, and much more for inline wrapped bales. Bale Armour is also a great way to secure and extend the life of your plastic sheeting over bale stacks by reducing plastic lift. "It took me and my son 2-3 hours to cover my stacked hay with a hay tarp the last 3 years; the tarp was heavy and awkward to deal with. Due to strong winds in this area, I was always worried the tarp wouldn't take the beating and, before 3 years was up, it was shot. This year, I covered the stacked bales of hay with plastic and then with Bag Man's Secure Covers-all in about 30 minutes and without help (a one man job)! Less than 1/2 the time and 1/2 the cost-incredible! We had busted our butts to get the tarp tied down tight before, but this was a piece of cake!" Find out more about Secure Covers for bunkers, piles and bags on the Bag Armour® and Secure Covers pages!